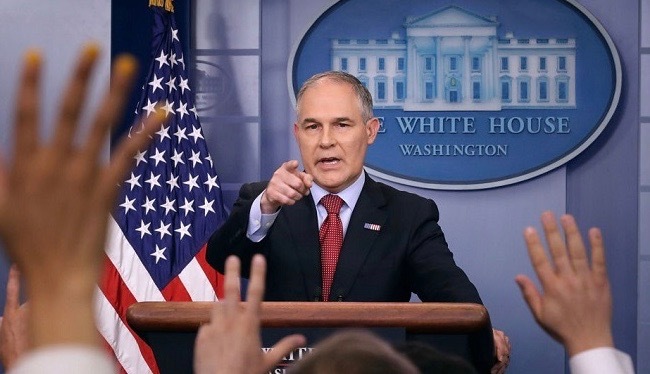 Environmental Protection Agency Administrator Scott Pruitt answers reporters' questions during a briefing at the White House. Pruitt previously chaired the Republican Attorneys General Association while he was Oklahoma’s attorney general. Photo by Chip Somodevilla / Getty Images. This story is a collaboration between MapLight and The Intercept. An association of top Republican law enforcement officials has created a secret online bulletin board called the “Briefing Room” that’s allowing big donors to help shape legal policy, according to records reviewed by MapLight and The Intercept. The Republican Attorneys General Association, or RAGA, frequently directs officials working for GOP attorneys general to review files posted on the file-sharing website before participating in conference calls hosted by RAGA’s nonprofit policy arm, the Rule of Law Defense Fund, or RLDF. The association works to get Republicans elected to the top law enforcement job at the state level. The Briefing Room is hosted by RLDF on the virtual cloud website box.com. Republican law enforcement officials in more than a dozen states denied having records of the bulletin board or argued that documents kept on the Briefing Room shouldn’t be made public. Nine offices said they have no records of communications with RAGA or RLDF. While communications between elected officials and RAGA and RLDF should be subject to disclosure under open records laws, the secret bulletin board can shield the correspondence from public reach. Zack Roday, a RAGA spokesman, said the Briefing Room is a tool for RLDF staff to share policy documents “with the RLDF team.” When asked about a past RAGA information sheet that “posting access” to the Briefing Room for donors who give more than $25,000 annually, Roday said the file “was worded incorrectly and has been changed.” However, the 2018 RAGA membership sheet contained the very same offer. Roday insisted that only RLDF staff can upload documents to the bulletin board. Ethics experts said Republican attorneys general — who are responsible for ensuring compliance with open record laws — are improperly hiding their own policy dealings from the public. In recent years, ethics watchdogs have criticized RAGA because its members worked with donors like Devon Energy to challenge Obama-era air pollution regulations. RLDF has helped GOP attorneys general organize some of their federal challenges. Environmental Protection Agency chief Scott Pruitt previously chaired RAGA and RLDF while he was Oklahoma’s attorney general; he sued the EPA 14 times while in that role. RAGA’s largest donors in 2017 included the Judicial Crisis Network ($2.9 million), a dark money organizationthat led a $10 million media campaign to confirm Supreme Court Justice Neil Gorsuch; the U.S. Chamber Institute for Legal Reform ($590,000), a trade association that works to limit lawsuits against corporations; and Koch Industries ($205,000), the global conglomerate run by billionaire brothers Charles and David Koch. Some RAGA donors have been involved in a range of state-level investigations and lawsuits, including Marathon Oil Company, Mallinckrodt Pharmaceuticals, and Purdue Pharma. Purdue, the manufacturer of the popular painkiller Oxycontin, is being sued by 14 states for allegedly downplaying the addiction risks posed by its prescription opioid medication. RAGA members are leading the lawsuits in Ohio, Alabama, Missouri and South Carolina. RAGA is a political organization created under Section 527 of the Internal Revenue Service code, which means it can accept unlimited donations from corporations or individuals. RLDF, which was created as a dark money nonprofit, is not required to disclose its donors, but tax returns show it has received at least $785,000 from the Judicial Crisis Network since 2014. State records show that RAGA regularly pays thousands of dollars to send state officials to donor conferences at luxury hotels around the country. At one meeting last year, RAGA arranged a golf outing and a museum tour to connect attorneys general with donors who give the association at least $125,000 annually. RAGA spent more than $1,900 on first-class airfare to fly Nebraska Attorney General Doug Peterson and his wife to the event. Emails sent in 2016 by RLDF’s former President Samantha Dravis, who currently leads the Environmental Protection Agency’s policy office, shed some light on what gets shared in RAGA’s Briefing Room. – A draft of Nevada Attorney General Adam Laxalt’s complaint challenging a rule by the Obama Labor Department that would have made 4 million workers eligible for mandatory overtime pay. – A document summarizing arguments against a Consumer Financial Protection Bureau rule requiring payday lenders to verify whether borrowers can pay back their loans. – A letter from attorneys general challenging the Obama Justice Department’s policy on transgender students’ use of restrooms and locker rooms. Shortly before a RLDF policy call in July 2017, Louisiana Solicitor General Liz Murrill emailed RLDF to add an item to the agenda — a letter requesting the Health and Human Services Department give attorneys general the authority to investigate complaints of Medicaid fraud by beneficiaries. Seven Republican attorneys general ultimately signed the letter, which was sent in September. Records show RLDF hosted at least seven policy conference calls with senior officials in attorneys general’s offices between June and November. Emails about four of the calls mentioned the Briefing Room. MapLight and the Intercept found references to RLDF policy calls in emails provided by the Nebraska, Arizona and Ohio attorneys general’s offices. The Nebraska and Arizona attorneys general’s offices rejected requests for any Briefing Room materials referenced in emails received by their officials, on the grounds that the files were not produced by their offices and were posted to a third-party website. The Nebraska office notably declined to release copies of documents mentioned in a May 2017 email, received by the attorney general’s chief of staff, where RAGA’s policy director told state officials that new items had been added to the Briefing Room and provided them with direct links for each document. The increasing secrecy around RAGA communications comes as RLDF has coordinated efforts to roll back federal regulations closely with the current administration, creating an organization of state officials to work with the White House. Annie Donaldson, a special counselor to President Donald Trump and the chief of staff to the Office of White House Counsel, traveled to a RLDF conference in May in Charleston, S.C., ethics records show. RAGA paid more than $75,000 to host events at Trump family properties last year, including a dinner at Mar-a-Lago, the Palm Beach resort and golf club where the president has spent 52 days since taking office.